Cariboo-Grown & Cariboo-Hardy Perennials. Since 1991. Perennial. Zone 3. Plantaginaceae, formerly Scrophulariaceae. Syn. Penstemon pubescens. A.k.a. HAIRY BEARD-TONGUE. North America. In Canada, from Ontario eastward. The entire plant – leaves, stems, buds, flowers – is entirely covered by tiny, silky hairs, hence the Latin and common names. Penstemon hirsutus is an attractive North American wildflower which is widely grown in gardens. There are numerous forms, including a dwarf type, Penstemon hirsutus ‘pygmaeus’, which is very popular in alpine gardens. Colours may range from pure white through pale lavender to rosy tones – but the most common is the blushed lavender pictured above. This Penstemon is a quietly elegant, rather understated plant. The foliage clumps are attractive, being composed of smooth, satin-textured, dark green, lanceolate leaves. Its roots are rhizomatous, and the plant slowly expands from its center. Penstemon hirsutus is completely non-invasive. Mature plants may be carefully divided and replanted in early spring to prolong the plant’s life, as they can get quite woody and die off in the centers. Slender stems arise in early summer, 18 to 30 inches tall. 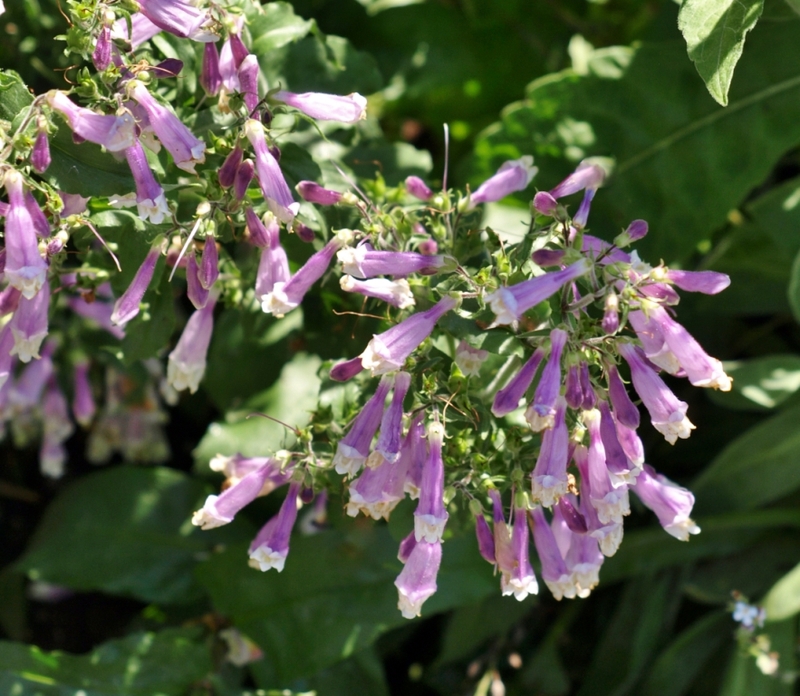 These are lined with loosely arranged whorls of small, pale-purple-flushed-with-darker-highlights, tubular flowers in late June through July. The buds and flowers have a silken sheen which rewards a closer look. A rather beautiful plant, though not at all what one could call “showy”. I am fond of it, for its ease of growth and self-sufficiency – no need of staking or pruning or any sort of fussing – and its profuse blooms, always alive with bees. All of the Penstemons are great hummingbird favourites, and this species is no exception. Penstemon hirsutus is happy in any average garden soil. It is drought tolerant and can be used in xeriscape plantings, but will get larger and bloom more with at least a bit of supplemental moisture in the hottest months of summer. Full sun is best, though it can tolerate part-day light shade. A pleasant front-of-border plant. Hill Farm Nursery is located in a rural area north of McLeese Lake, B.C. We are not set up for on-farm visitors at present, but we hope to host you here in future years. Hill Farm Nursery will be bringing in a selection of heirloom tomato starts, and perhaps some other antique, seed-saver-friendly garden treasures. See you there! Williams Lake Farmers' Market site, in the parking lot between the Cariboo Memorial Recreation Complex and Kiwanis Park. Hill Farm Nursery hopes to attend! We will be bringing in a selection of heirloom tomato starts and seed-saver-friendly garden treasures. Hardy perennials, too, many with heritage history from the Cariboo and beyond! Now in the parking lot beside the Recreation Centre/Pool. Head for Kiwanis Park and you'll find the Market! Visit the landscaping experts at Blocks R Us for all your hardscaping needs, from topsoil to paving stones. Look for annuals from Frank's Nursery, and premium trees and shrubs from Bron and Sons. Hill Farm Nursery is taking 2018 off; we hope to be back in 2019. Lakeside Tourist Info Site, located between the Oasis Pub and the Oasis Cafe, and directly across from the McLeese Lake General Store. Time: 9 A.M. till 1 P.M. SCOUT ISLAND NATURE CENTRE, Williams Lake, B.C. An oasis of peace on the outskirts of a bustling industrial area. Excellent trail network; something to see 365 days of the year - wildflowers, birds, aquatic life and small mammals. Nature centre, resource library, knowledgeable & enthusiastic naturalists on site. DAVID DOUGLAS BOTANICAL GARDEN, Prince George, B.C. Located at the University of Northern British Columbia. A small but interesting perennial flower display garden, lilac display, waterfall & bridge, and the Alice Wolczuk Alpine Garden. GOODSIR NATURE PARK, Salmon Valley, B.C. 20 miles north of Prince George. 160 acre private nature reserve, 6 miles of trails, open to the public May-Oct. Wildflowers & trees; an active beaver pond; plant museum, guided & self-guided tours; excellent signage; some rare plants. Picnic tables, firepits & camping available. Entry free; donations welcome. OSOYOOS DESERT CENTRE, Osoyoos, B.C. 2 km of boardwalk through B.C. 's rarest ecosystem, the "pocket desert." Wildflowers, birds, reptiles, small mammals. Guided & self-guided; small visitor centre. ANCIENT FOREST TRAIL, near Dome Creek, Robson Valley, B.C. (Along Highway 16, halfway between Prince George and McBride. Watch for large signs: "Ancient Forest".) Hiking trails through ancient cedar forest, including a recently completed 1/2 kilometer wheelchair accessible boardwalk portion. Built by dedicated volunteers; a prodigious amount of planning and sheer hard work went into this trail system, and it shows. Worth a stop to walk the boardwalk; you will be inspired to come back and hike the wilder trails as well. Huge cedar trees, ferns, water features - a prime example of B.C. 's rare and endangered Inland Rain Forest. Interpretive signage at parking lot, outhouses, well-thought-out wheelchair unloading/loading area and beautifully designed boardwalk. Donation box. This website represents many years of experience and many hours of labour. We are pleased to participate in the free and open transfer of information over the World Wide Web, keeping the following in mind. Personal non-commercial use of our text and images is warmly encouraged for all, and for our nursery customers in particular. You may copy, print and store our info for your own purposes. If sharing, we ask that you please cite Hill Farm Nursery as the source. All images are taken by us and most of those (but not all) have the tag HFN (for Hill Farm Nursery) in the caption. All written material and HFN images are copyright Hill Farm Nursery. Fellow gardeners, plant groups, societies and associations, you are welcome to re-publish our material as long as it is cited, credited and/or linked. COMMERCIAL RE-USE POLICY: We request that you contact us for permission for COMMERCIAL re-use of any of our written and photographic content: bscharf@uniserve.com. High resolution jpegs of most images on this website are available for a fee.